Prime Minister Benjamin Netanyahu cut short his trip to the United States on Monday after a rocket fired from Gaza struck a residential building in central Israel early Monday morning, injuring at least seven people, including two infants, and leveling the structure. 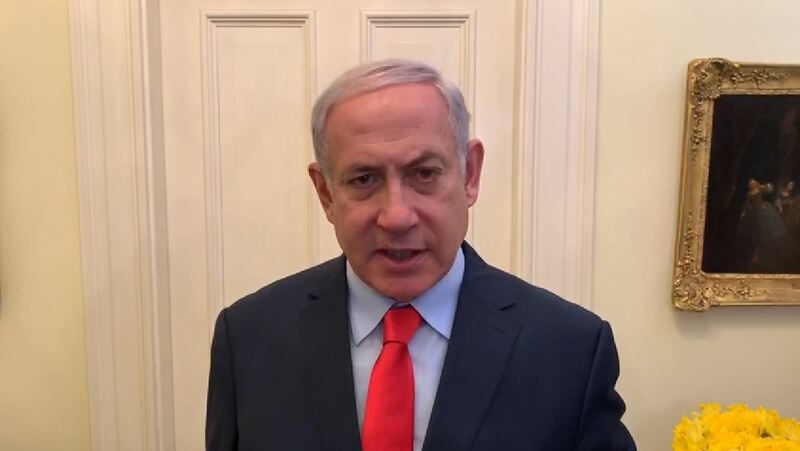 “A few minutes ago I finished a briefing and consultation with the chief of staff [of the IDF], the head of the Shin Bet and the national security adviser,” Netanyahu said in a hastily released video from Washington. “This was a criminal attack on Israel and we will respond forcefully,” he vowed. The prime minister is to meet Trump at the White House on Monday for the expected signing of an order recognizing Israel’s sovereignty over the Golan Heights. On Tuesday morning, Netanyahu was set to address some 18,000 people at the American Israel Public Affairs Committee annual policy conference in Washington, and in the evening was due to attend a dinner at the White House. This entry was posted on March 25, 2019 at 8:49 AM and is filed under Uncategorized. You can subscribe via RSS 2.0 feed to this post's comments. You can skip to the end and leave a response. Pinging is currently not allowed.